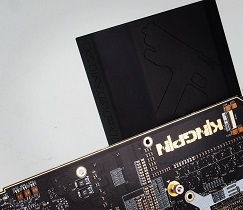 The Kingpin series is a super-high-end, super-powered line of premium GPUs designed by EVGA. Given this reputation, IT correspondents speculate that the next generation of these cards will be based on the RTX 2080 Ti. The existence of this new card has been leaked on Instagram. The EVGA Kingpin series often integrates the highest end of GPUs with elaborate features to make cards with serious performance (and serious price-tags). For example, the last iteration came with the NVIDIA GTX 1080 Ti, paired with a copper heat-sink, 2-way SLI support and a guaratee of overclockability to 2025MHz. Now, it appears that the Kingpin is back, perhaps with an RTX card this time. This possibility has been raised by a recent image posted to Instagram by Vincent Lucido (or overclockingpin). It shows a board with Kingpin branding. A Videocardz correspondent has proposed that it is for the RTX 1080 Ti. This theory is mainly based on the fact that the image also shows what may be a liquid-nitrogen (or LN2) cooling block. The inclusion of the 2080 Ti may enable the newest Kingpin to compete with the upcoming ASUS ROG Matrix and MSI Lightning cards. The release of such 'enthusiast-grade' gaming cards may help with the uptake and development of ray-tracing support in the future. However, this card still lacks a release date at present.